Chip Somodevilla/Getty ImagesSen. Susan Collins. Minutes after Republican Sen. Susan Collins of Maine announced her decision to vote to confirm Brett Kavanaugh to the Supreme Court, a site raising money for Collins’ eventual opponent in her 2020 reelection bid crashed. Collins was one of the undecided votes in the judge’s controversial nomination. 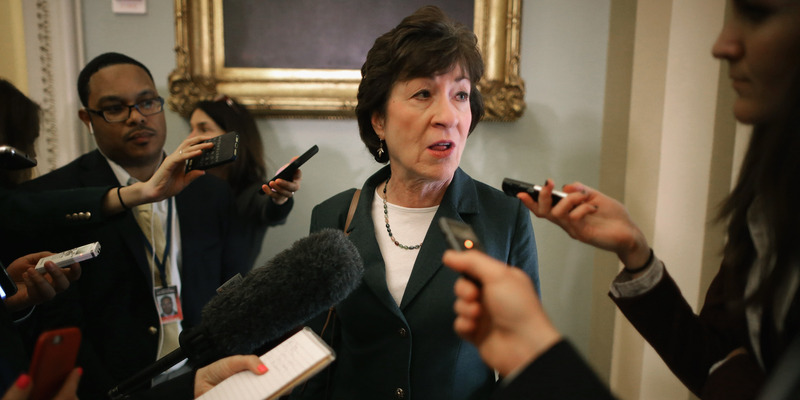 In an effort to convince Collins that there would be consequences if she voted to support him, a group of people from Maine launched a crowdfunding campaign on a site called Crowdpac. The campaign asked people to pledge money to back the person who will challenge Collins in 2020 if she voted to confirm Kavanaugh. If she doesn’t vote for Kavanaugh, the pledges would be void. The site was so overwhelmed with people rushing to donate to the campaign that its internet connection couldn’t take the traffic, pushing it offline, Crowdpac confirmed to Business Insider. As of September 12, when The Washington Post reported on the fundraising effort, it had raised more than $US1 million from 37,000 pledges. Some had questioned whether the campaign violated federal bribery statutes, which prohibit giving or offering anything of value to government officials in exchange for any acts or votes. A Twitter user named Marty Loughlin said that he donated to the campaign right before the site crashed on Friday and that it had raised $US2 million in pledges. The site was back up later Friday and said it had raised nearly $US2.2 million from more than 75,000 pledges. Another page that vows to support Collins’ eventual Democratic challenger was up and accepting donations on Friday afternoon, though it wasn’t clear how many donations it had racked up. A representative for Collins told The Post last month that the senator wouldn’t be swayed by any fundraising tactic. “Today’s actions motivated more people to donate than we have ever seen before – and they turned to Crowdpac to make their voices heard. Leading up to Senator Collins’ announcement that she will be voting ‘yes’ on Judge Kavanaugh, the Crowdpac campaign to fund her challenger surpassed $US2 million in pledges from over 70,000 Mainers and Americans across the country.